These strange looking animals grow to about 20 cm long, with the queens able to grow bigger. They can live for over 30 years, which is a very long time for a rodent and they are very tough. Scientists have found out that the don’t get cancer and don’t feel pain. They are well suited for living in underground tunnels, with long, sharp teeth that grow outside their mouths so that they can dig without getting dirt in their mouths. They can move their teeth independently which is very strange. Their tunnels can go for many kilometres and are used to find tubers under the ground. One tuber can feed many mole rats for a long time. In addition to tubers, naked mole rats also eat a lot of their own poo. This is because it’s hard to get most of the nutrients that they need from their food, so they eat it again. 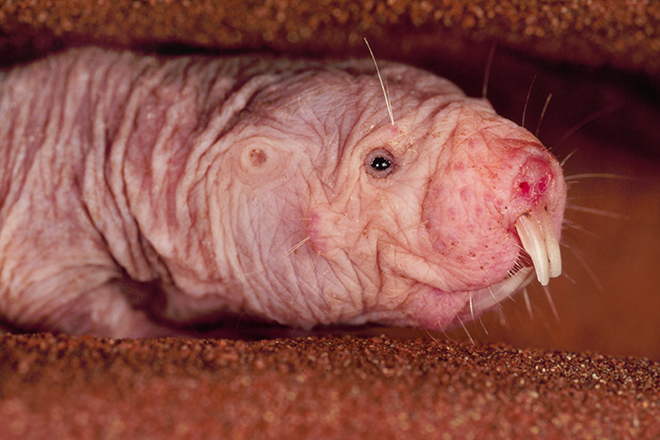 Naked mole rats are quite common and can be found in dry areas of east Africa. Are there any other interesting facts that you would like to share about naked mole rats?